Creamy Taco Dip - only 4 ingredients and it's ready in 5 minutes!!! 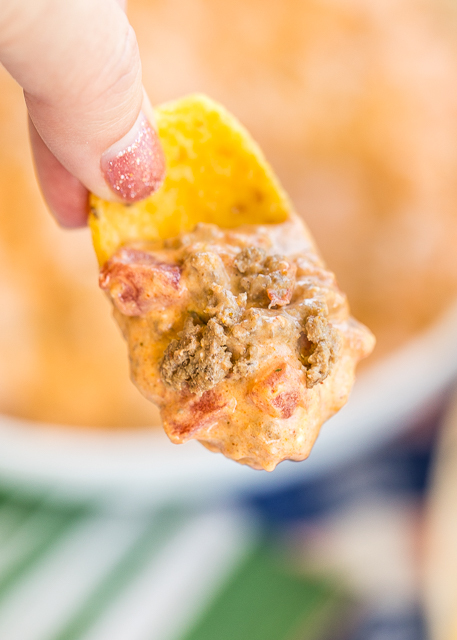 People go nuts over this easy Mexican dip recipe!! Serve with Fritos, tortilla scoops, celery or bell pepper slices. You might want to double the recipe, this is always the first thing to go!! Great for parties and tailgating. OMG! I am totally addicted to this Creamy Taco Dip! I made a batch for watching football last weekend and it almost didn't make it to the party. Whoops! I should have doubled the recipe because everyone was hovered around the slow cooker eating this yummy dip. There are only 4 ingredients and it takes about 5 minutes to make. I made it on the stove and transferred it to a slow cooker to keep it warm during the game. The base of this Creamy Taco Dip is cream cheese. Now, I hate plain cream cheese. I won't eat it straight out of the package. BUT I absolutely LOVE cream cheese in dips and casseroles. Just don't try and give me a bagel with cream cheese for breakfast. 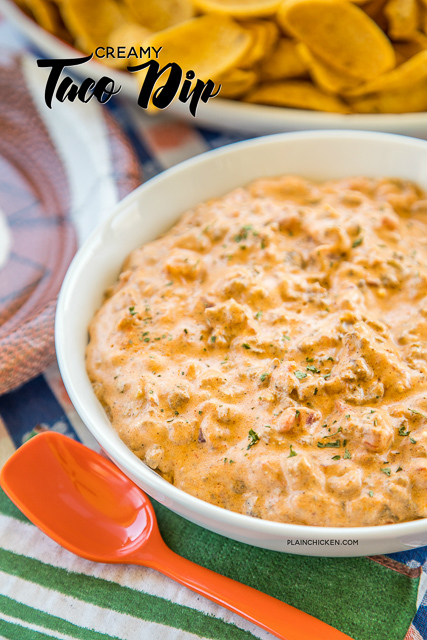 A bagel slathered with this Creamy Taco Dip - yep! LOL! As I said, this Cream Taco Dip is easy and dangerously delicious. We love to eat it with Fritos or the tortilla scoop chips. You could also serve this with some celery sticks or bell pepper slices. No matter what you serve the dip with, I promise it will be good. Give this dip a try the next you need something quick and easy for a party. It is always a hit! In a large skillet over medium-high heat, cook ground beef until crumbled and no longer pink. Drain. Add taco seasoning, Rotel and cream cheese to skillet. Stir until cheese melts. 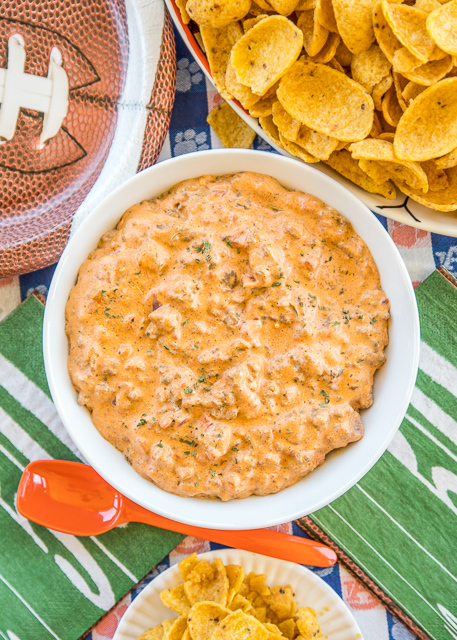 Do you drain the Rotel before adding it to the dip? Hi Stephanie, I am curious where it gets its yellow (cheese like) color from? It is nice to see a dip that does not use Velveeta! This is so good! I have prepared it for two different events and it was a success both times. Thanks for a yummy and simple recipe!